Clifford Brown was one of the most influential jazz trumpeters and was a true master of jazz. His fantastic tone, time, feel and command of the jazz language have been inspiring jazz musicians on all instruments for decades. This book breaks down many of the one and two-bar phrases played by Clifford and helps students apply them to their own playing. Lines played over minor, dominant, and major chords as well as short, long and minor ii-V material can be mastered by practicing with the accompanying play-along CD. Chapters on Guide Tones, Bebop Scales, Targeting, and Playing the Upper-Structure will help students analyze and memorize the lines presented in the book. 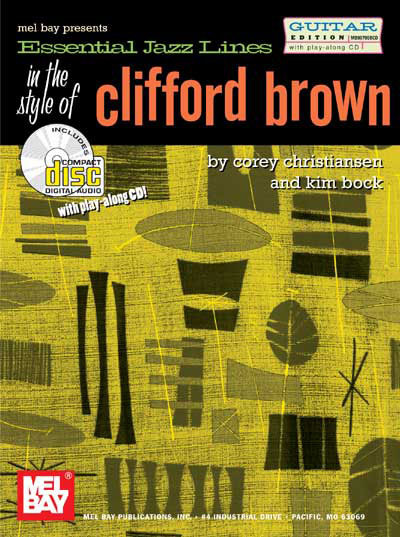 There is also a chapter with further insight in Clifford’s style which discusses his phrasing as well as other musical devices he used to get his sound. A must have for aspiring students wanting the master the jazz language.